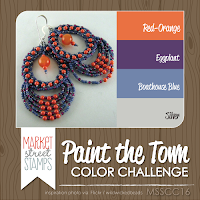 JENerally Speaking: Paint The Moxie Town! The weather is finally starting to settle after experiencing lightning and thunder for most of the day. The hounds were not at all impressed. They tend to bark at thunder - maybe they think it's another dog? They also don't appreciate the fact that I am rather adverse to standing in the rain and lightning to throw their ball for them! Anyhow while they had a boring day I was a busy little bee in the Craft Cave. Among other things, I made a couple of cards for the July Market Street Stamps Paint the Town Challenge. 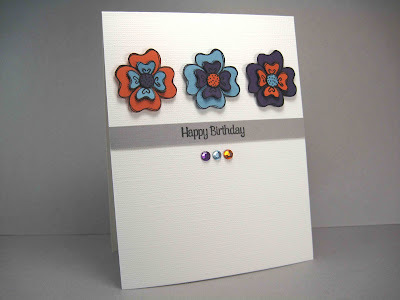 I found the colours to be rather tricky at first especially with that silver thrown in there but I ended up making two cards using the flower from the Homegrown set. For the first card I paper pieced the flowers, popped them up and added a sentiment strip and gems. 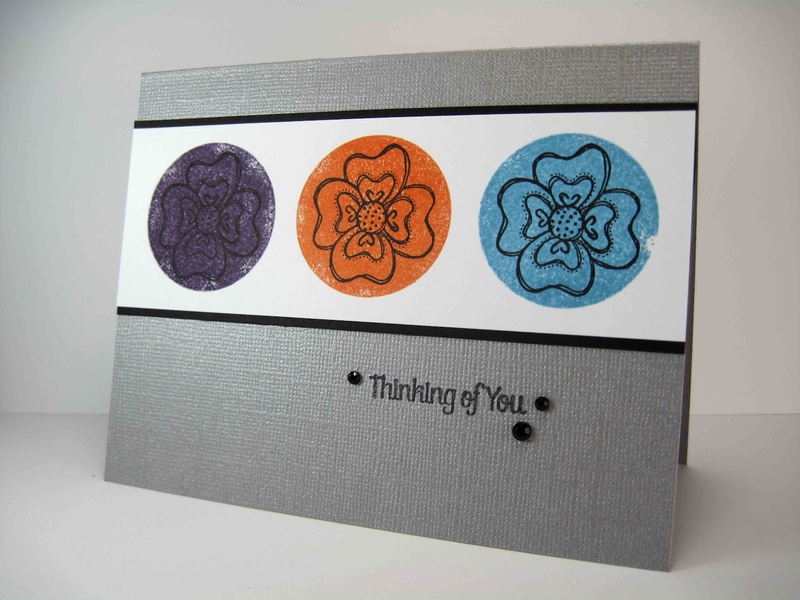 For the second card I used the back side of the flower to stamp the circles, stamped the flowers over them and then matted it onto a silver card base. I'm also going to enter these over at the Stamp It! Cards Week Challenges at the Moxie Fab World - the Thank You challenge and the Hello challenge. Thanks for looking and hope your week is off to a good start! It doesn't look to me like you struggled at all - they're both fab, but I admit to a special liking of the one with the matching gems! Great cards, Jen! LOVE that you flipped the stamp over to get those colorful circles! Way to stretch your stash! 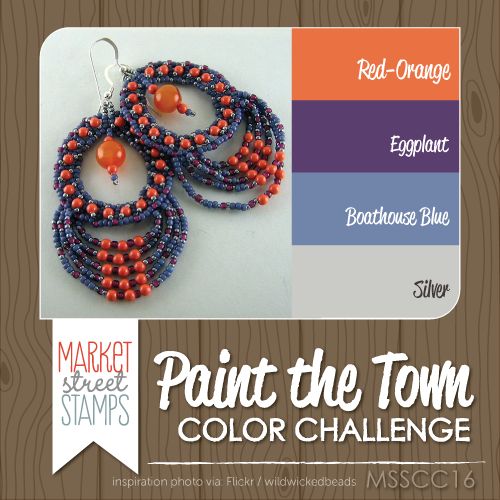 Thanks so much for playing along with the MSS Paint the Town Color Challenge this month! Well...you rocked the colors...they are absolutely fabulous cards Jen!! Such elegant designs Jen! Love the added silver, isn't that what these challenges are all about (not just pulling our hair out)! These two are so very classic in their design, and yet have pops of unexpected color. So very well done! Hope you get a chance to take your pups out soon to play. See! Don't say that you have trouble with color, lol! Maybe you have trouble picking colors but you really excel at combining them and keeping them balanced. Both cards today are fabby! I think it's the way you used the silver that really makes the cards! Hope the lightning and thunder have passed! It's funny, Cooper is afraid of the garbage man and school buses, but thunder, no problem! Silly doggie! I love both of these CAS designs, Jen! Your fussy cutting and layering look fantastic, and I love the way you used the back of the stamp on the second card. I never remember to do that! Hope your day is less stormy! I think these colors are VERY tricky - ok, I actually hate them - but you rocked them. Two great cards with super-Jen style! Abby didn't like the thunder we had yesterday either - she whined & whimpered & generally had a miserable time of it...and to top it off we were away, so she didn't have her usual haunts to hole up in for the duration! wouldn't have ever thought to put those colours together, but they work SO well on your cards jen, love that with the same colours and stamp you still came up with two completely different cards! 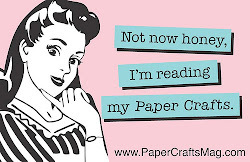 Paper Smooches GD Take Four & A Giveaway!